We raced up to South Fork to make some engagement pictures! We didn't anticipate how soon we'd lose the sun up there on those steep mountain faces, and so when we arrived, we hustled up into the wildflowers. Sandy slipped out of her shoes to be able to climb the rocky trail better. She's like that, though: up for it, there for it! In fact I've always loved Sandy's energy--ever since I first met her on the WWVA running track, sweaty from high school track practice, the same gleaming smile she's got in these images beaming on her face. And then there's Josh: silly, driven, and sweetly protective of Sandy, carrying her shoes and making sure she had his hand if she needed it. 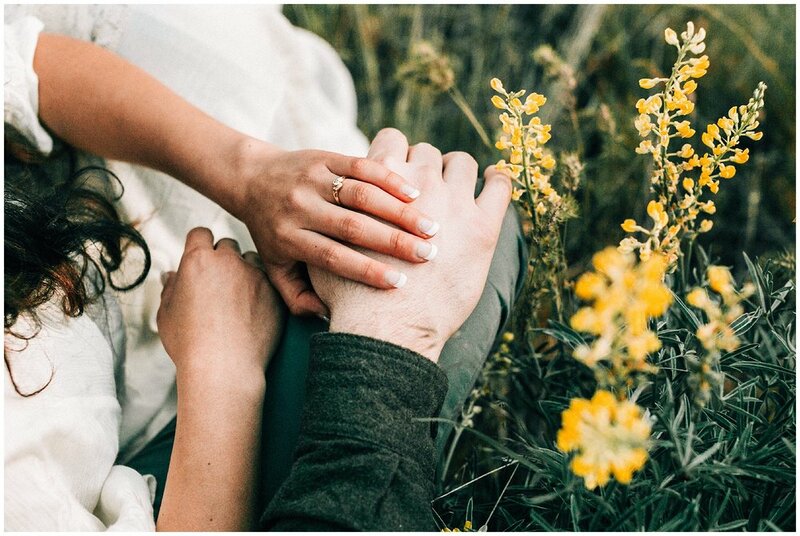 I didn't get to shoot these two's amazing wedding in the Wallowas...sadly our dates didn't align. But I loved this evening in the mountains with them last spring. Makes me dream of hiking up through yellow lupine and feeling the soft brush of greens on my ankles again.